Latin America is a region of great diversity and a rich laboratory for understanding the processes of political development and their interaction with economic growth, social modernization, and cultural influences. 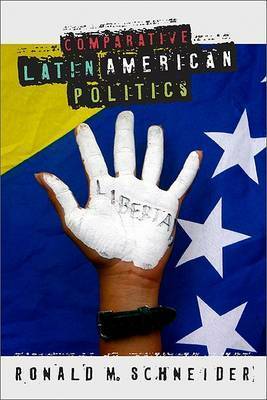 Highlighting crucial periods of dynamic socioeconomic and political change, Comparative Latin American Politics provides a balanced, concise overview of select Latin American countries without underestimating the complexities of a region noted for its striking differences. The book focuses on the dominant dyad of Mexico and Brazil while also considering in detail Argentina, Chile, Peru, Colombia, and Venezuelaseven countries that contain four-fifths of the regions inhabitants as well as an even higher proportion of its economy. Recognizing that political institutions and cultures are built over generations, author Ronald M. Schneider divides his analysis into two parts. Part one examines the period from independence to 1930, when countries were coping with an array of post-independence problems and challenges of national consolidation. Part two concentrates on 1930 to the present day and fleshes out current political practices and structures. Each part devotes chapters to specific country coverage as well as meaningful comparative perspectives that illuminate the political evolution of the region and offer salient lessons for other developing parts of the world. Ronald M. Schneider is professor of political science at Queens College, City University of New York.